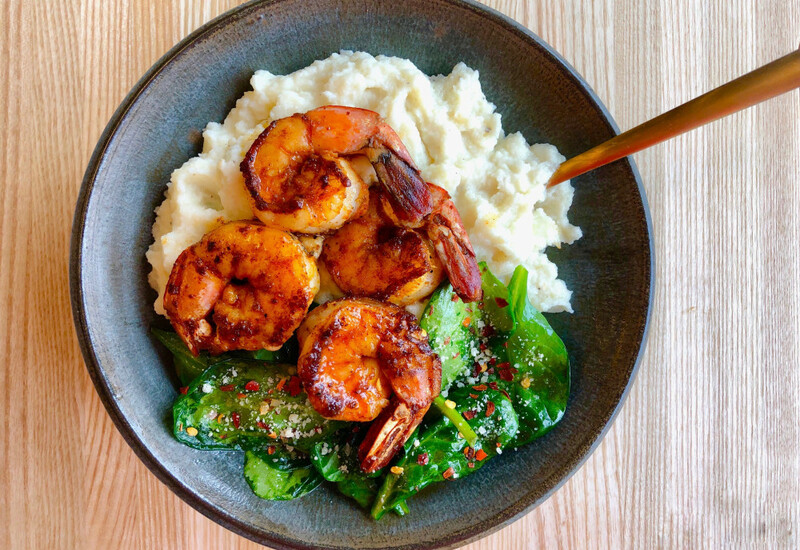 This creamy cauliflower mash and juicy shrimp are the perfect pair. The entire dish is great for a Keto diet, and it does not lack any flavor! This one-pot meal is so simple and would make a perfect weeknight meal, although fancy enough for a dinner party. Substitute 1 tablespoon jerk seasoning for paprika to add a little bit of a kick to the flavor profile. Use a vegan Parmesan cheese to make non-dairy. Skip Parmesan cheese to make this a Whole30 and paleo-friendly meal. Per Serving: 377 calories; 17g fat; 13.3g carbohydrates; 42g protein; 282mg cholesterol; 1551mg sodium. Cooked this last night and everyone absolutely loved it! The shrimp were juicy and flavorful and the cauliflower mash was a perfect pairing!! Another great recipe! I loved this quick and easy I didn’t have spinach so made asparagus sautéed in garlic and olive and sprinkled a little Parmesan and black pepper on top, sooo tasty.